Last Wednesday Tim and I took a day trip from Victoria BC, past Sooke, almost all the way to Port Renfrew to Mystic Beach. 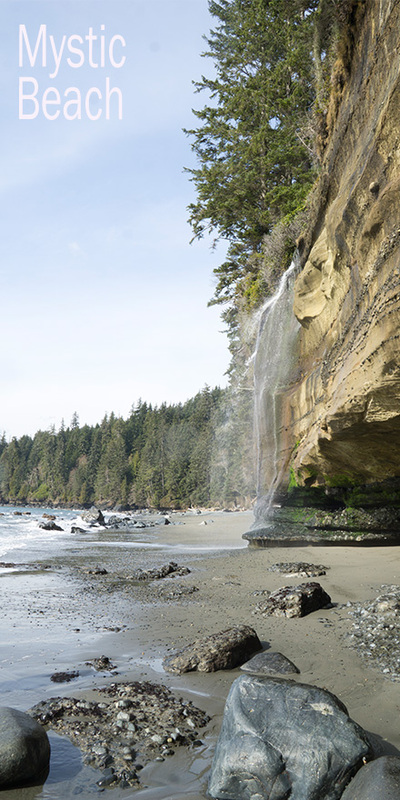 We chose Mystic Beach as part of the Juan de Fuca trail because it has a fabulous suspension bridge, covered forest trails and a beautiful beach with waterfalls at the end. 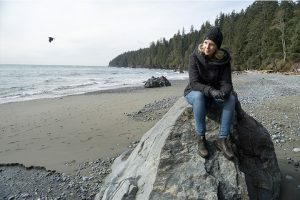 Mystic beach is about an hour and a half drive from Victoria B.C. We stopped at Shirley Delicious in Shirley for a little treat. The windy roads and hills make for kind of a pukey ride for a passenger. The trail to Mystic Beach starts at China Beach. The entrance is gorgeous with beautiful forest with a windy road. Our timing was impeccable because they are closing the trails for some maintenance over the next few weeks. The suspension bridge goes over Peter Wolfe Creek. It is so high, you can bounce on it and look down over the creek below. The waterfall on the beach was stunning. What an incredible beach. If you watched all the way to the end say, “I am mystified by mystic beach.” in the comments.